Ornametals's Blog | We Fabricate Imagination! 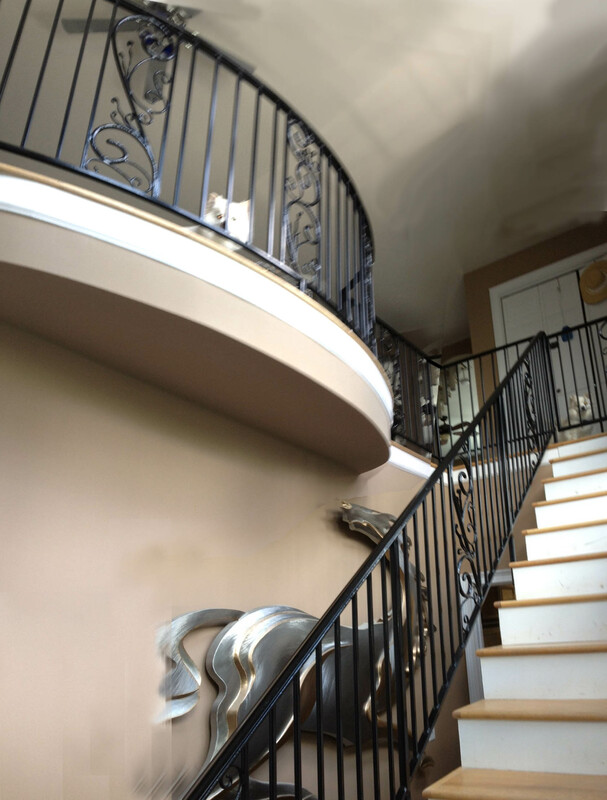 This custom spiral stairway was designed, fabricated and installed by Ornametals and Finer Welding, Inc. Tom Elfers, artist and owner of Ornamentals creates one of a kind railings, custom gates, furniture and sculptures for homes and businesses. 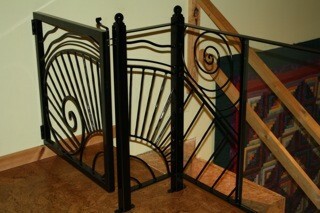 This railing has hand forged scrollwork and is constructed to the highest quality standards possible. Please visit our website at http://www.ornametals1.com to see more of Tom’s creations. This low profile swing gate offers homeowners beauty and added security. Tom Elfers, artist and owner of Ornametals and Finer Welding, Inc. designs and creates custom gates and entrances for homeowners and developments. Many people have second homes that are not always occupied. A security gate provides peace of mind while you are away. Driveway gates deter solicitors and unwanted visitors. Please visit http://www.ornametals1.com for more of our custom gates and entry designs. Ornametals and Finer Welding, Inc. specializes in custom gates and entryways for homeowners, developments and corporations. Tom Elfers, artist and owner of Ornametals is always expanding his vision and it is apparent with his newest design. This floral gate is entirely constructed with steel. The color is added by using copper and brass, stainless steel and the final touches by utilizing faux finishing techniques. The result gives visitors and owners a greeting they will not soon forget. From design and fabrication to rock columns, landscaping and automation, Ornametals does it all. Visit our website at http://www.ornametals1.com to see more of Tom’s unique designs and projects. Tom Elfers, artist and owner of Ornametals and Finer Welding, Inc. adds faux finishing to his artistic gates. At first glance this gate appears to be fabricated with iron and wood. Upon closer inspection you will find that this entrance gate is totally constructed with steel. The wood frame has been faux finished to take on the amazing appearance of wood. Please visit our website at http://www.ornametals1.com to see more artistic entry gates designed and manufactured by Ornametals. Tom Elfers, artist and owner of Ornametals and Finer Welding, Inc. has been self employed for over 30 years. His custom gates, iron sculptures and entrance designs can be seen throughout the country. Based in Western North Carolina, Tom prides himself on following 3 major criteria that he will not deviate from. 1) Dependability: From design to project completion, staying in constant contact with his clients and keeping them apprised of the progress, allows our customers to know that their project is important and on schedule. 2) Accuracy: Our quotes are honored and the computer design our clients receive upon acceptance is what they enjoy upon completion of their project. Changes along the way are welcome should our clients wish to make them and are clearly stated and acknowledged by all parties. 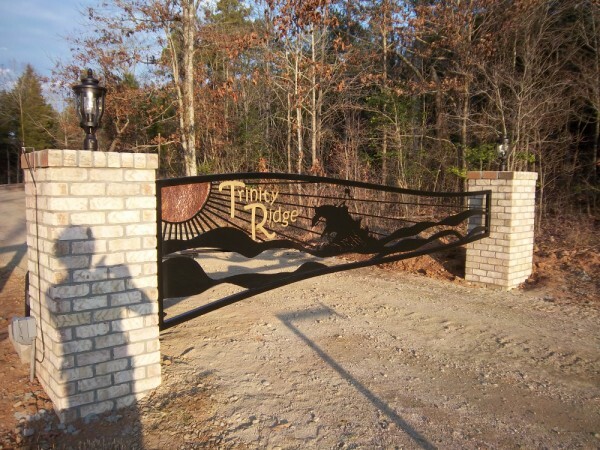 Tom Elfers, artist and owner of Ornametals and Finer Welding, Inc. creates custom gates, custom entrances and unique sculptures and furniture. This custom firescreen is painstakingly hand forged and fabricated to fit the built in fireplace. It is a one of a kind functional piece of artwork that truly adds ambiance to the living space. Please visit our website at http://www.ornametals1.com to see more of our creations. Ornametals and Finer Welding, Inc., had the honor of creating a beautiful entryway between buildings on Main Street in downtown Rutherfordton, NC. The entryway scrolls were hand forged and the archways are wrapped with lights which adds to the already beautiful ambiance of the town. Gold coins were incorporated into the design to commemorate the history of the Bechtel Mint. The new space has flower pots and benches for visitors and residents to rest and reflect on the beauty of this small town. Please visit our website at http://www.ornametals1.com to see more of our creations. 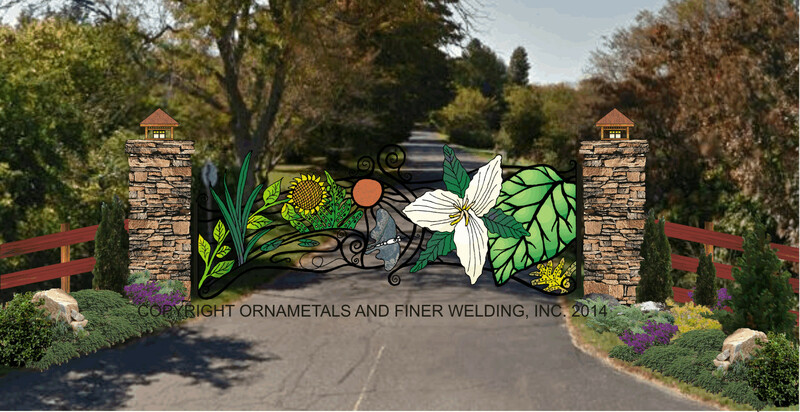 Ornametals and Finer Welding, Inc. specializes in entrance design, custom gates, sculptures, railing and furniture. Tom Elfers, owner and artist creates interior custom gates to separate and secure areas for children and animals. These gates are designed, fabricated and installed to order. A safety gate can be beautiful and compliment any decor. Visit http://www.ornametals1.com to see more!